Ok so I started the morning by sorting some TOP 1:50.000 maps of Kenya which had been published in the 1970s. Due to the chronic lacking of a decent storage concept, these maps had been exposed to direct sunshine, rain (~ the obligatory leaky roof) and lots of dust during the last 30 years. They had been torn apart, written on and stuffed into some overcrowded drawers somewhere in the office. The other day we had a delegation from the World Bank coming over from Nbo for a meeting and my colleague frantically searched for a specific map and – of course – couldn’t find it at all. Quite embarassing. Upon arrrival in Embu, I suggested that we install something called “the data office”: a room where we’d keep maps and other data. After all, these guys here are “supposed to” have their own Graphical Information System (GIS) runing within the next two years – and right now we don’t even have a decent map with all boreholes within our catchment area, nor do we have any further data. So I was fed up with the situation and started by pulling out some older drawers which I prepared to store these maps. My colleague, the guy who is supposed to be in charge of all data, did like the idea, but prefered to enjoy his morning in a rather Nyayo-style: reading the Daily Nation and sipping on his 10 a.m. tea. I asked him to join me on this job, but he kept on having this “Ati?, me I am not even getting paid to do this manual work….”-look on his face. We see 5 p.m. approaching and a friend of mine awaits me with a towel outside the offices. Off we are to enjoy some rounds in the pool @ Izaak Walton Inn! Swiming is Ksh. 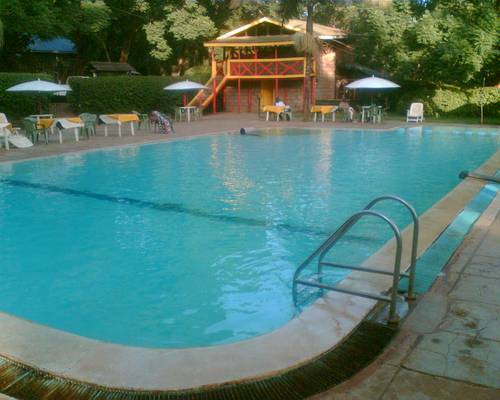 200 /= for non-residents, the pool opens from 8am-6.30pm. How again does one manage to avoid the Nyayoesque lethargy of ones colleagues!! – I need the tips. Enjoy the swim. Seems they painted that pool house, it was really shady the last time I was in that neck of the woods.